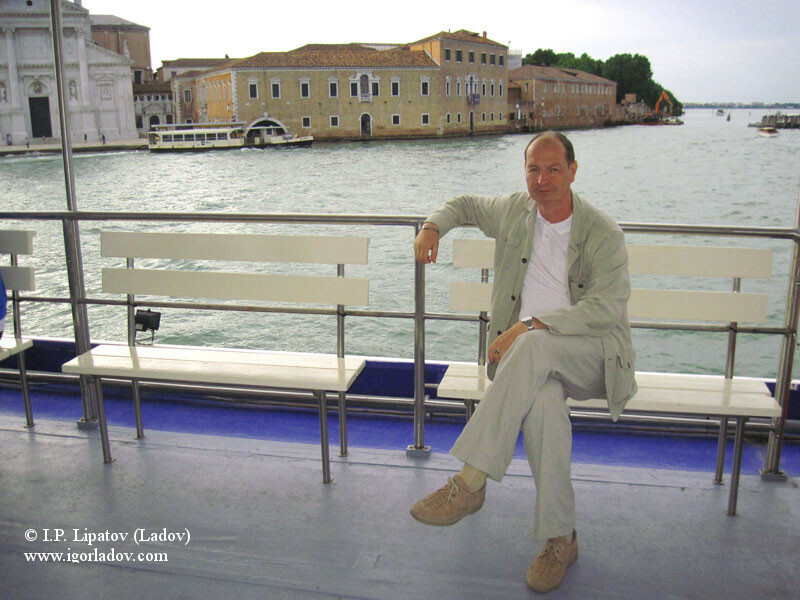 Igor Ladov (Lipatov) – Russian philosopher and painter. English version. 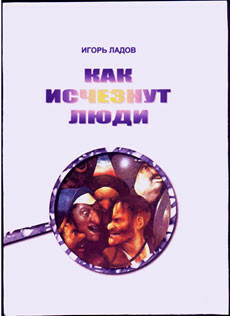 Excuse for mistakes of translation from Russian into English language probably made by the author. Igor Petrovich Ladov (Lipatov). Family name - Lipatov, Ladov - a pseudonym. Was born on February, 18th 1966 in city of Astrakhan, Russia. Philosopher, painter, expert in the field of information technologies. Nationality — Russian. On a line of mother an origin from noblemen. 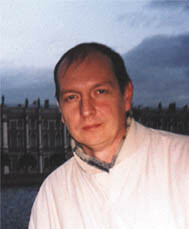 The author of books "The World Outlook", "As people will disappear" and of many articles. Russian Federation, 414040, Astrakhan, p/o 40, a/ya 82. Here some photos from a my family album. 1. The God as an alive being appears during evolution of the Universe. 2. The mankind is only a stage of this evolution. 3. The divine nature will fundamental differ from a human nature. 4. The human body by the nature is predisposed to death that is consequence of its evolutionary imperfection. 5. All organisms before appearance during evolution of the God are defined as pseudo-alive. Really alive organism during evolution should become the God. 6. The God, who should appear as a result of evolution, will consist of two higher being, men and female. 7. After appear as a result of evolution of the God, the Universe will be changed by God in the perfect condition. 8. The God and the Universe changed by God will exist eternally. The Superperson-God will origin from Europeans and, most likely, from Russians. Those who does not wish to be lost together with mankind which degrades and dies, should create from itself the new kind, species, new mankind. New mankind which will serve the God. The book "World outlook". In the work the world outlook of the author is given. The book represents a new religious and philosophical system of views. The wide range of questions is reviewed: religious, philosophical, psychological, and also the historical events directly concerning the chosen subject are mentioned. The author is often asked, who had the closest system of views given in the work. Perhaps, Frederick Nietzcshe had the closest views. Some general views on the world, reflected in the book, resemble zoroastrism. Dostoevsky's way of thinking is close to the author's one. Despite the criticism of the bases of Christianity given in the book, the orthodox way of thinking is close. The main ideas thesis of the work that God, as an alive being, comes out during the process of evolution, of the development of the Universe. Before his appearance as an alive being he is present in the Universe as Spirit. This point of view is substantiated in the book by the several evidences. The talk goes about God, the Most High and Almighty, instead of, for example, "superperson". After his appearance God can change the Universe into a perfect condition. The capability and the inevitability of such transfiguration is substantiated by the conforming reasoning. In the book it is shown, that God should appear from the mankind, and, accordingly, in our planet. Here it is shown, that God will be made of two beings - God and Goddess. "God is not only a being of a man's kind, God is the divine man and the divine woman, God and Goddess. Both of them will make God the Most High, being his indispensable parts. How much, during the history of the mankind people spoke about love between a man and woman. It was given a great value, saw in it something mysterious, lofty. Really, in this feeling a certain outlook was visible, the thing that should come true, but never have done it among the people. This riddle of love is that God is God and Goddess loving each other. Therefore God is love (part 1, chapter 5)"
The process of evolution of a substance in the Universe is shown in the way: inanimate substance - pseudo-living substance - life or God. The introducing of meanings "pseudo-living matter" and "pseudo-alive organisms", is called by necessity to show principled difference of God and precursory to him in the process of evolutionary development organisms. In the book this difference explicitly is described. As shown in the book, the development of the Universe, before God's appearance as an alive being, descends in struggle between Spirit of God and spirit resisting God (or spirit of a devil). God's spirit is directed to perfection, creation, development, evolution, spirit of resistance to destruction (annihilation) anything, to degeneration: "This spirit aims to blast anything, and if it creates something, only as means of destruction. It expresses by itself imperfection and a tendency to destruction, to destruction of its own. As a matter of fact, the spirit of a devil is a spirit of an imperfection (part 1, chapter 6)". In general, in the book, the properties of this spirit explicitly are esteemed, and, due to the non-conventional approach, as it is represented here, it was possible to show more correctly and realistically. The great attention in the work is given to human nature and bases of human psychology. These problems are esteemed by means of allocation of main (basic) tendencies of a person: tendencies to the development, the perfection and tendency to the death, the decomposing. It is shown, that the second tendency in a person (as well as other organisms precursory to God's appearance as an alive being) has the advantage of the first one. On the basis of these two tendencies the main (basic) features of human psychology explicitly are described. In the book the division of people into three main (basic) types is given. The division is based on the degrees of the evolutionary perfection of different people. The relationships between different types of people are esteemed. The great attention in the work is given to the consideration of actions of God's Spirit and spirit resisting God in the human company. So, for example, Christianity explicitly is esteemed. It is shown, that Christianity, in its initial state, was directed against the hierarchical system of the government and against the evolutionary highly developed people. The influence of Christianity on different types of people is described. It is shown, that Christianity was step-by-step assimilated by the peoples and in many things became a contrast of its initial bases. In the work, from the point of view of development of the Universe, the importance of the highest human qualities, including morals is shown. In the book the destruction of the monarchic states and aristocracies is esteemed. The reasons are investigated, the sense of this is esteemed from the point of view of the development of the world and forthcoming appearance of God as an alive being. The advantages of the monarchic, class state are described. The considerable attention is given to Russia in connection with the above mentioned subjects. It is shown, that Russia is an heiress of the sequence of the great states in the history of mankind. The reasons are esteemed, on which Russia was subject to many tests. The opinion is given that with great confidence it is possible to expect God's appearance from Russian people. The conclusion of the book is devoted to the Court of God above people. It is necessary to mark, that in the book the conclusions and the propositions are justified and represent a system of views, the world outlook. 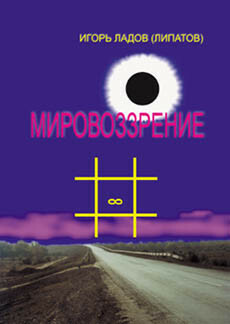 The symbol, which you can see here on the cover of the book, expresses views set up in it. In the book the question on disappearance of mankind, during evolution and appearance of the superperson. The author thinking that "a sunset of mankind" inevitable, searches for ways for the most true and ecologically pure development of this process. Work continues the theme of the superperson begun in the previous book "World outlook". In "World outlook" general-theoretical questions, here - more practical have been mentioned. In the book the answer to a question is given: what to do to the highest people who wish to be separated from mankind? Pictures painted in oils, pastels and photos. 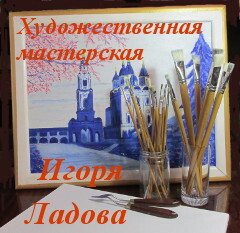 Here you can look Igor Ladow's picture albums (photos island Kizhi, the city of Petrozavodsk, lake the Onega, White sea, islands Solovetskie, the city of Kislovodsk, mountains of Dombai). The rights on the given materials belong to: © I.P. Lipatov (Ladov) 2000-2018.